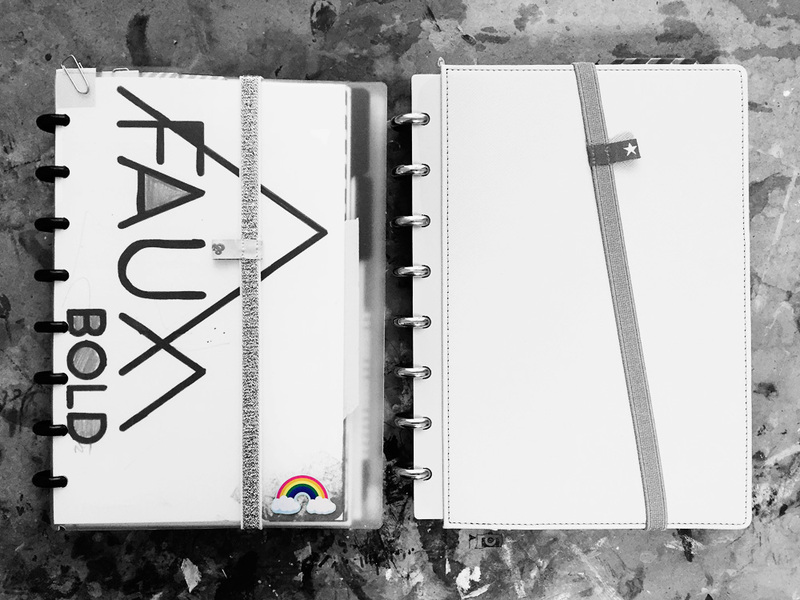 I put together two planners in the last couple of weeks – on the left was a gift for my RV traveling sister and brother-in-law. The right is my new 2017 planner! I hadn’t planned on buying a new notebook but I went to Staples to buy 1″ black rings and they were out… ended up falling for this creamy beige/gray Marth Stewart notebook. I love the fabric-like texture it has. On the right are my monthly templates you can purchase for $12. They’ve been my favorite to use so far, although I do want to work on a month spread that will take up two pages. 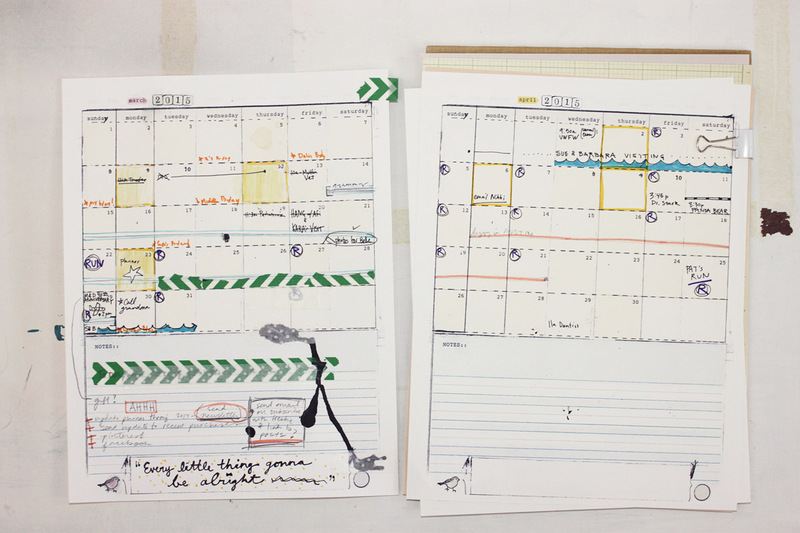 I really only use a month view – on paper and online. 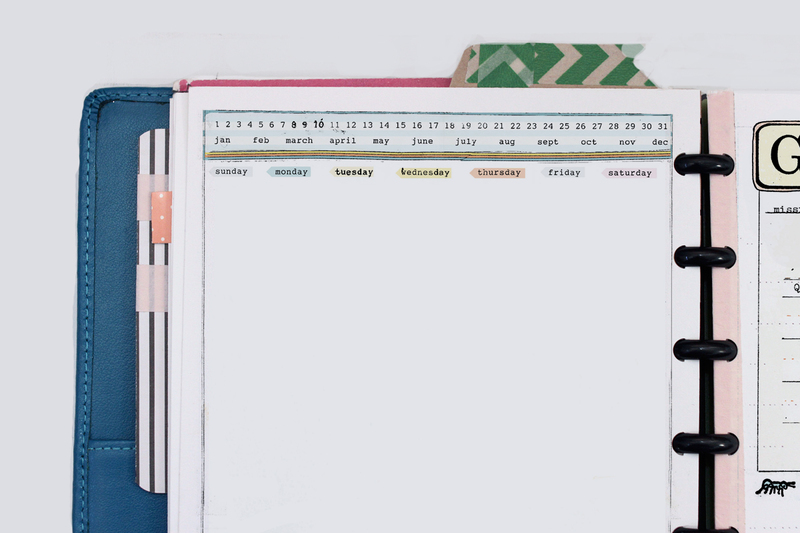 I live by my google calendar in month view (don’t tell my planner, ha!). 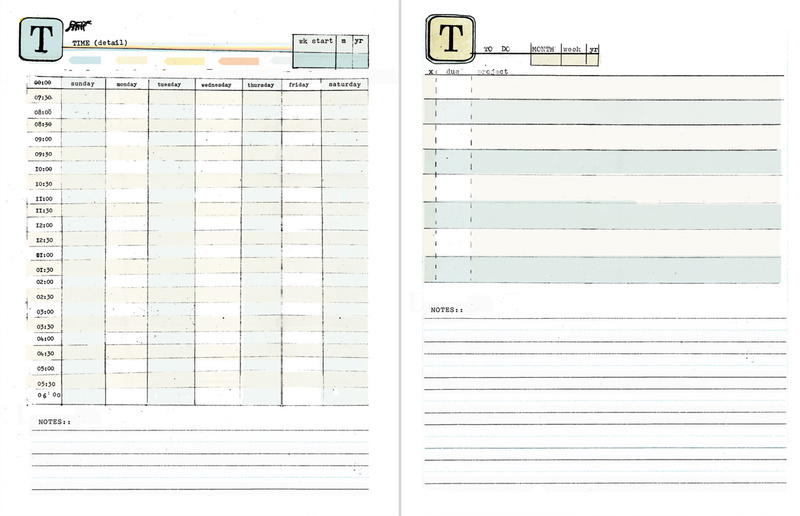 Another shot of monthly templates. 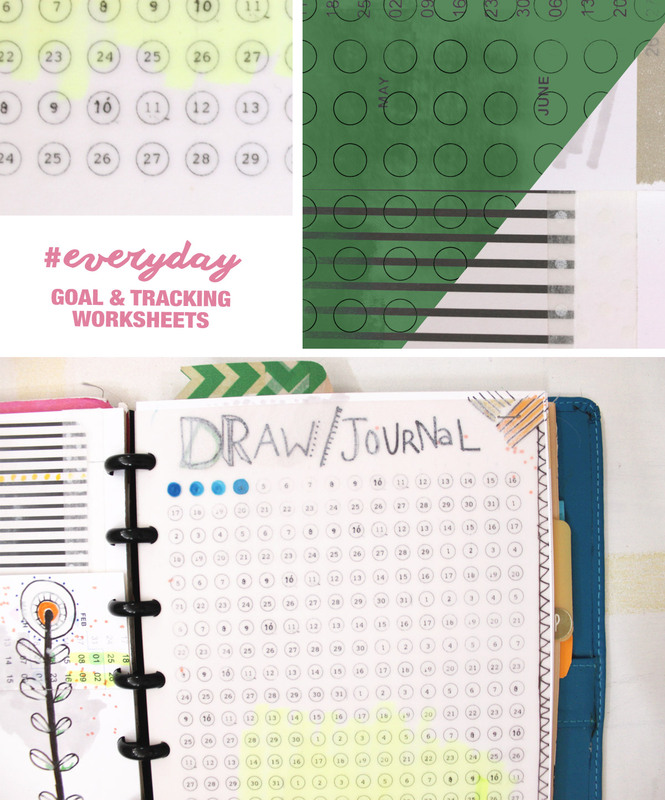 I’ve been looking for ways to simplify and be more productive while managing work, a household and two kiddos. Part of that is dividing things into 2 basic groups – things that I can accomplish with kids and things I can’t. 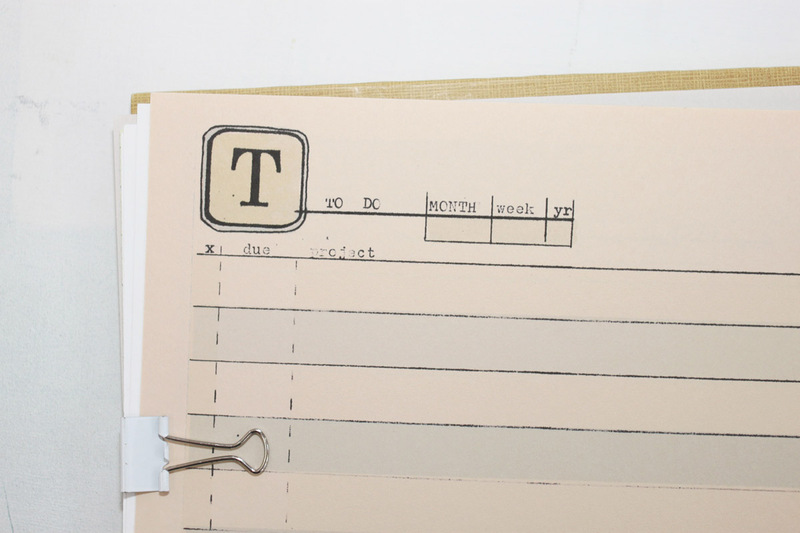 To help with that I’ve been making a quick daily list and leaving it on the kitchen counter – they usually have 5 or less tasks that I’d like to accomplish for the day and include house, kid, work and general life stuff. They’re not pretty, just scribbled quickly as I think of things. I’ll have flexible lists planned out for 2-3 days in advanced so I don’t end up doing laundry/cleaning (kid friendly) on a day that would be better used for work (solo activities). 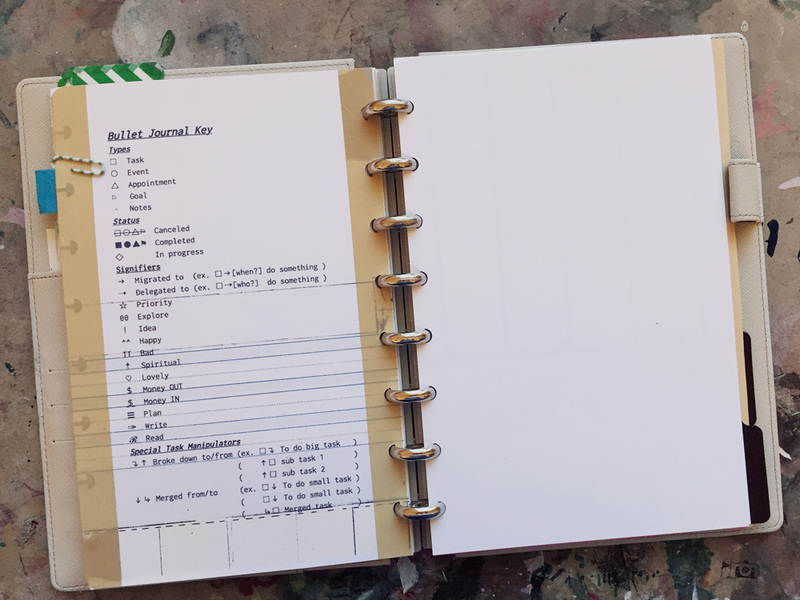 I’m not following the entire Bullet Journal system but I like the idea of rapid logging with bullets and signifiers (above left key by Shingo Omura). I’m excited about incorporating these into my daily lists. The rest of the notebook is just tabs and blank paper for notes and things. The end! 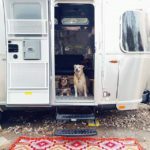 I made a few travel templates inspired by my sister and brother-in-law traveling the US in an Airstream with their pups. How cool is that?! 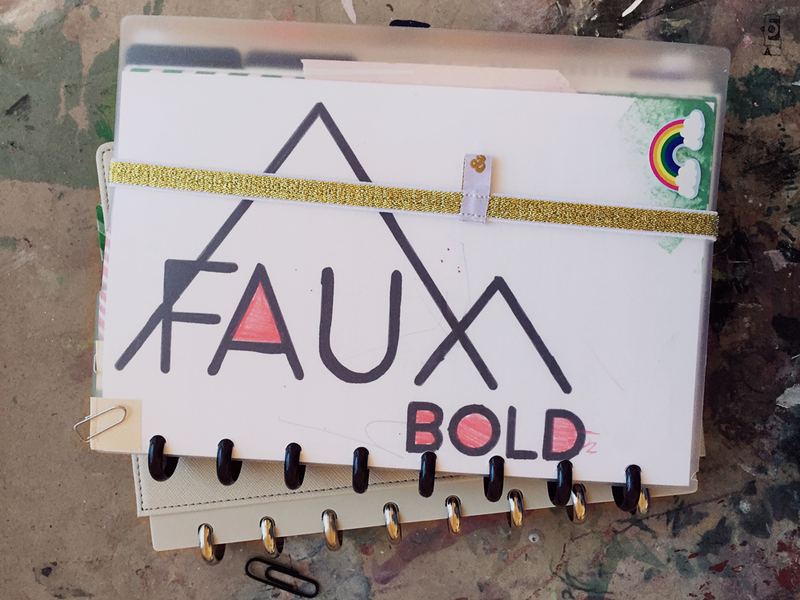 You can follow along on their adventures at fauxbold.space. I picked up the gold band at Michaels for a super deal, so cool. 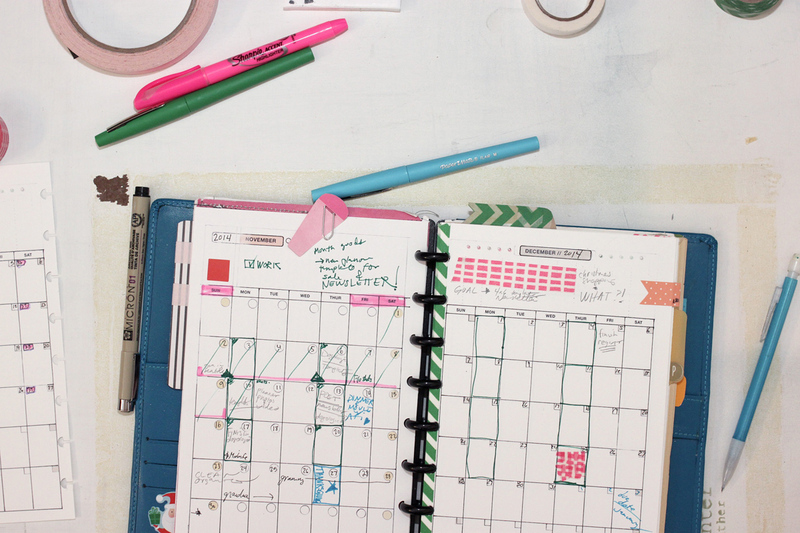 Pretty sure it was ‘The Happy Planner’ brand – lots of awesome planner accessories if you haven’t checked it out yet. Be prepared to spend $$ and bring your coupons. 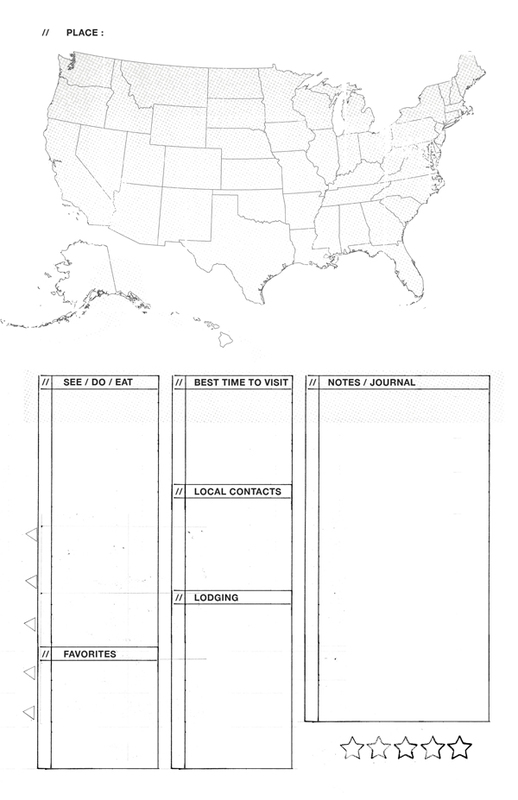 Travel templates! The left is a place tracker, to make notes before and after you visit. The right is a rough yearly overview of where you’d like to travel to. Downloads below. Threw in some day and week templates from here. 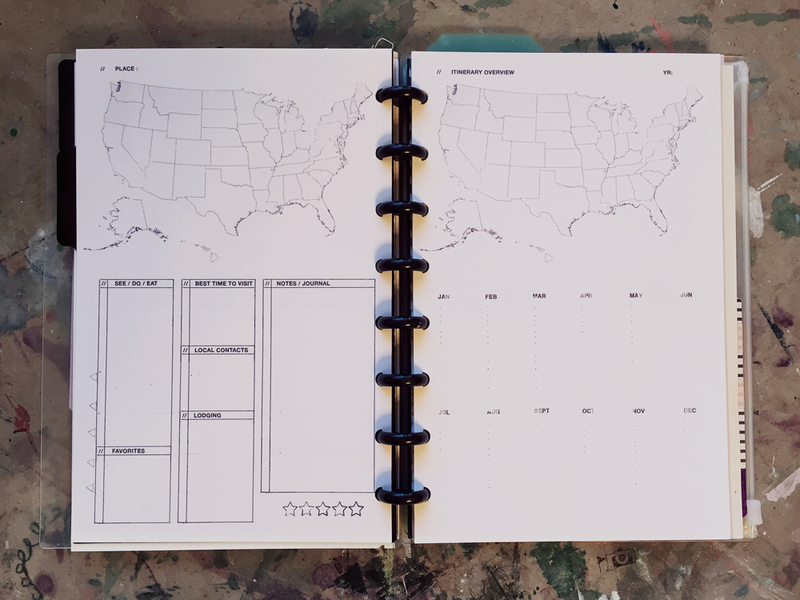 AND printed the months from this template.. these are scaled down from the 8.5 by 11 version but are now available in 5.5 by 8.5 (Junior ARC size) – I would’ve used the new version but printer is out of ink, boo. 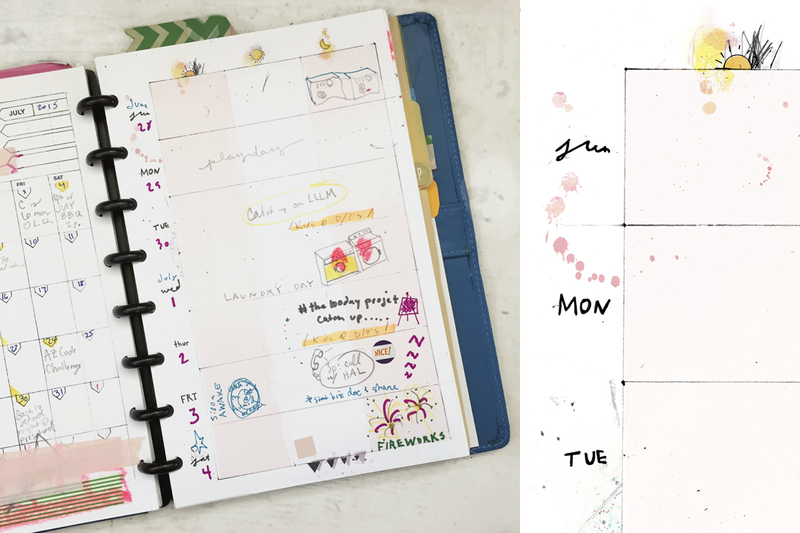 Make your own handmade, hand-drawn, mismatched DIY Planner full of doodles, goals, life plans and everything YOU. 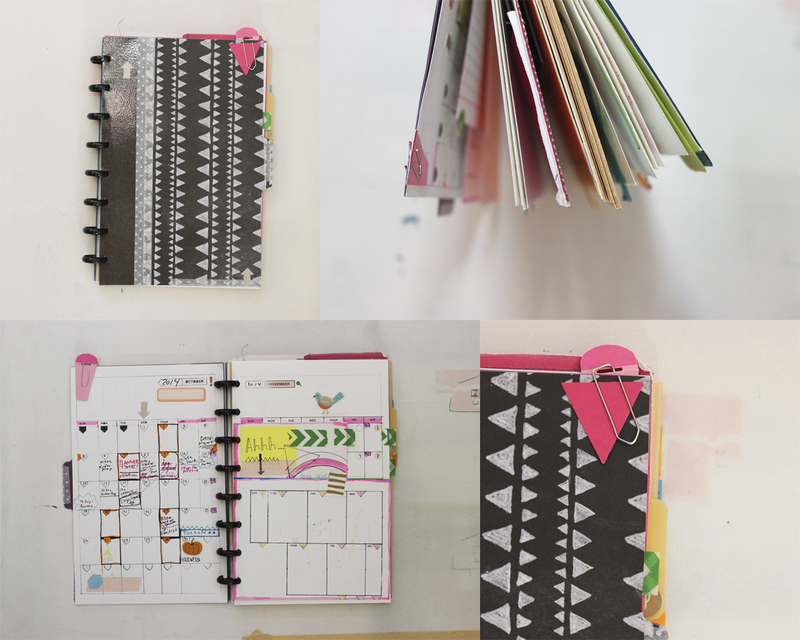 The silliest templates included – they remind me of sweet diaries I had as a kid. 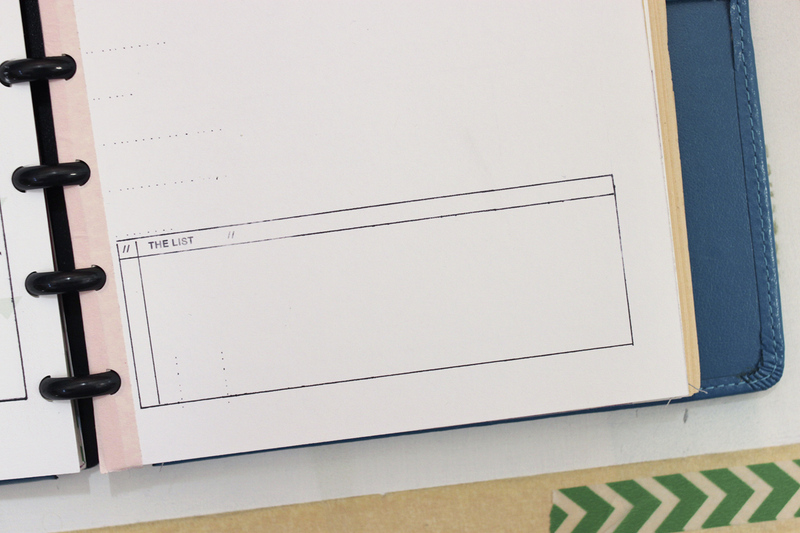 Use the daily notes page while taking notes during meetings or planning out busy days. 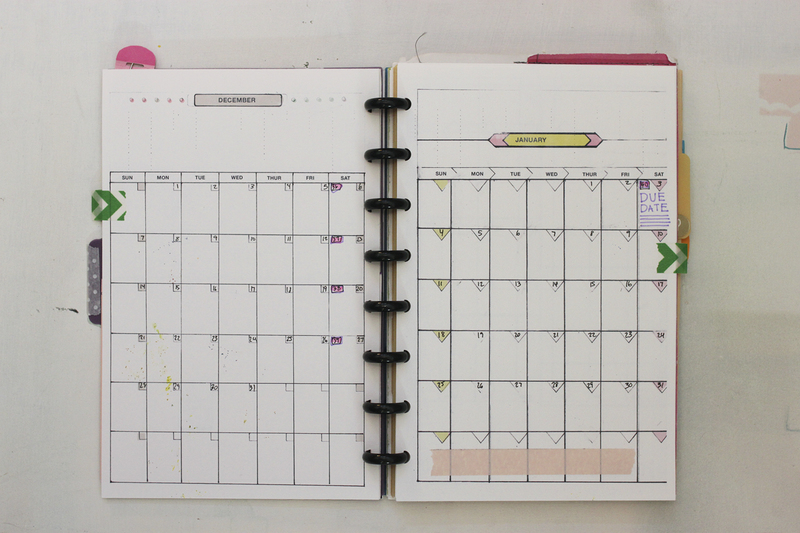 I include the blank month in case you love these so much you use up all the pre-dated pages. 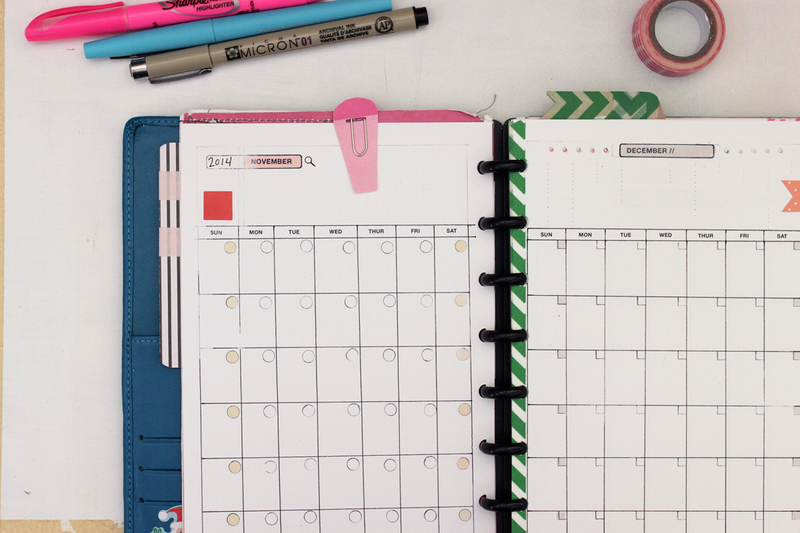 Just circle the month and write in the days – voila! 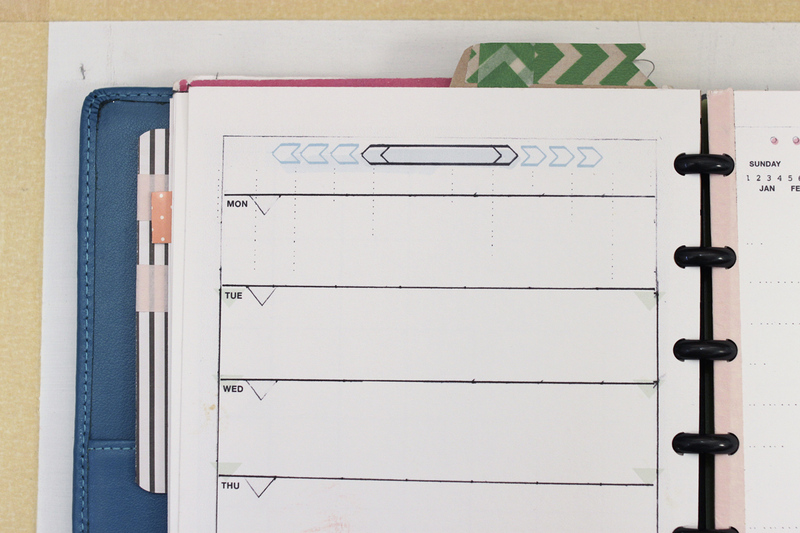 I don’t always use my planner and even ignore it for months at a time, gasp! It’s nice to have the un-dated templates so I can print out a bunch and only fill in the months I’m actually going to use. 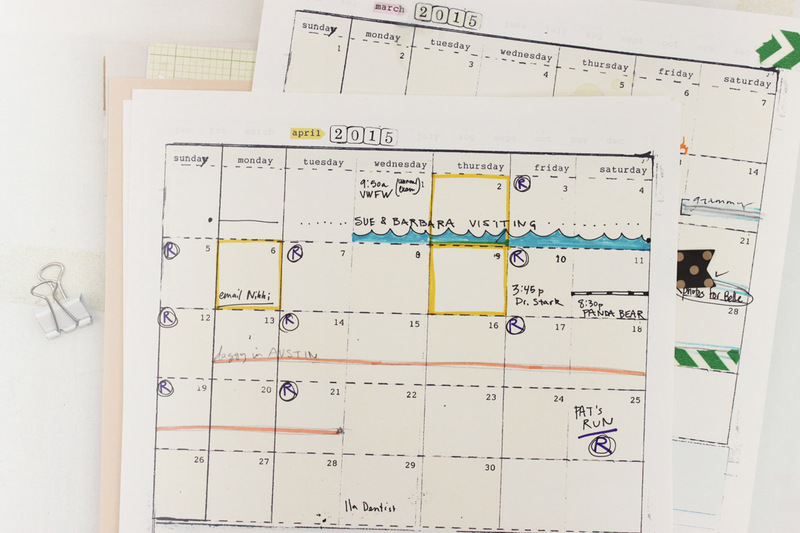 For those of you that like to plan your days down to the minute, this is a cool way to see the overview of your week. Now that I’m up all hours with a baby again I think I need to make a 24-hour version! One productivity tip you ALWAYS hear is to make a to-do list at the start of the week or in the mornings with 2-3 must-do items. And for that you need a to-do list! I use these for projects and events too. Happy two thousand and sixteen! It seems like EVERYONE is talking about daily habits these days, or, at least everyone I’m listening to (podcasts) or following on the internet. – Tammie Bennett on Raise Your Hand. Say Yes. podcast. I did #the100DaysProject last year and had so much fun – I shared all of my drawings on IG (@oh_amanda). It really does seem like the more art I make the more art I WANT to make. 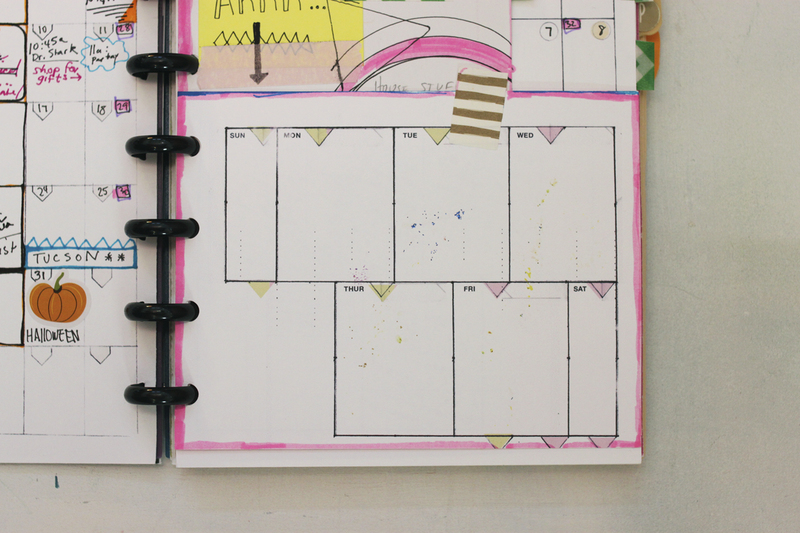 BUT I wanted something simple and a little messy to match my planner. 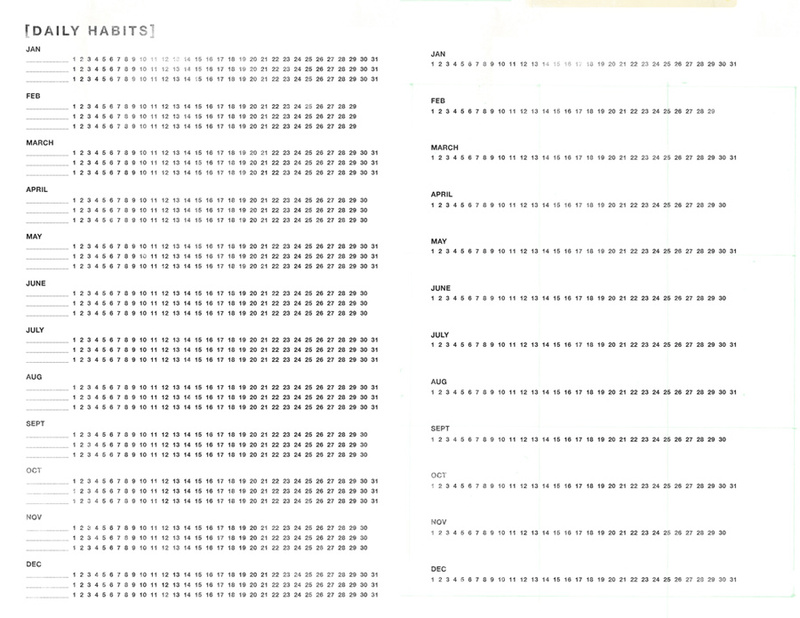 On the Daily Habits template there’s room for 3 habits every month. 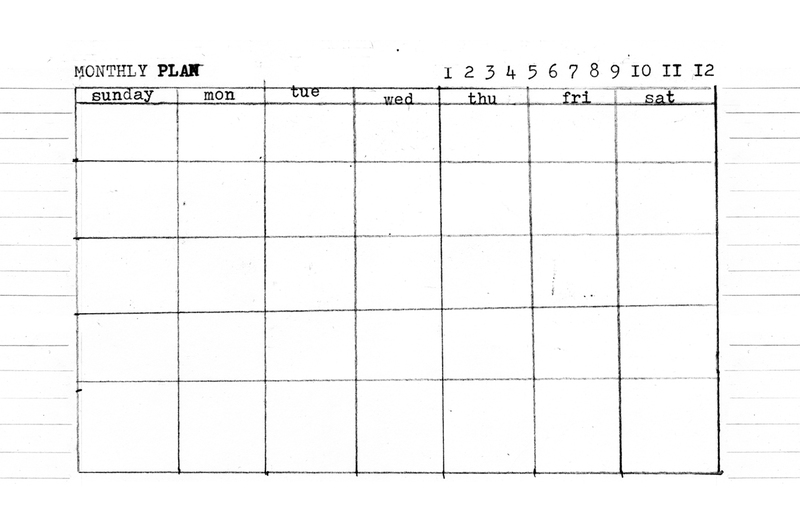 Write your habit on the left and mark out the days you complete them. The other is the similar but just one habit per month. Below on the left are 366 circles, one for each day of the year. On the right are 12 empty boxes – one for each month. And last!! 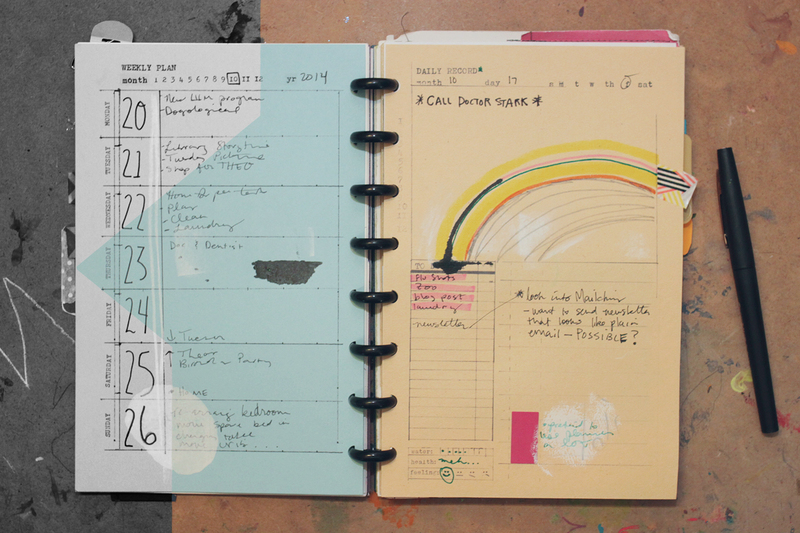 I threw in a year at a glance calendar for 2016 – an iteration of Dave Seah’s Compact Calendar. I’ve used different versions of this for years now. 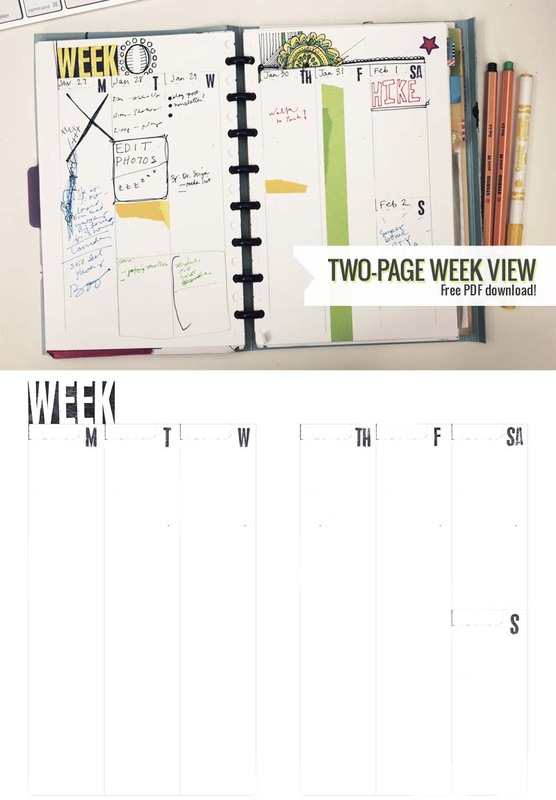 A random messy weekly template I threw together for a messy week. 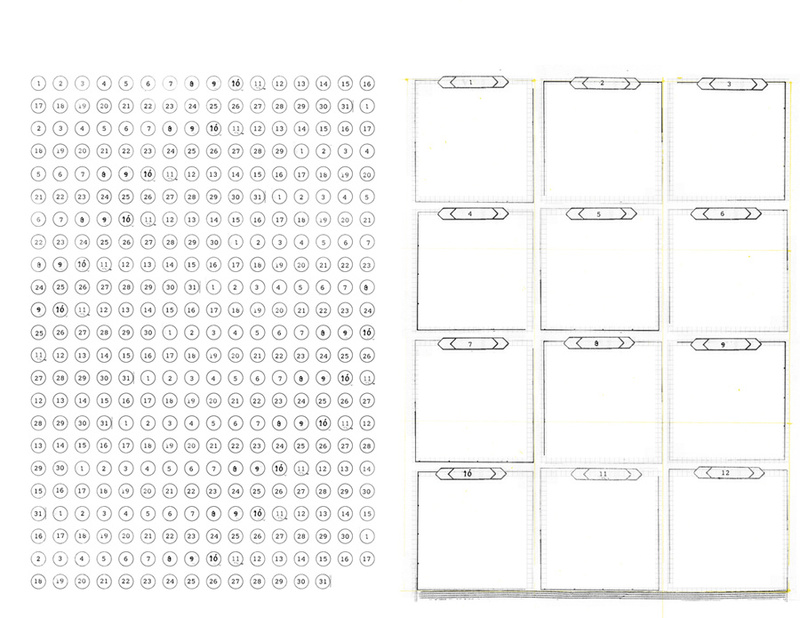 Printable template contains a full 8.5 x 11 and a 2-up 5.5 x 8.5 version. 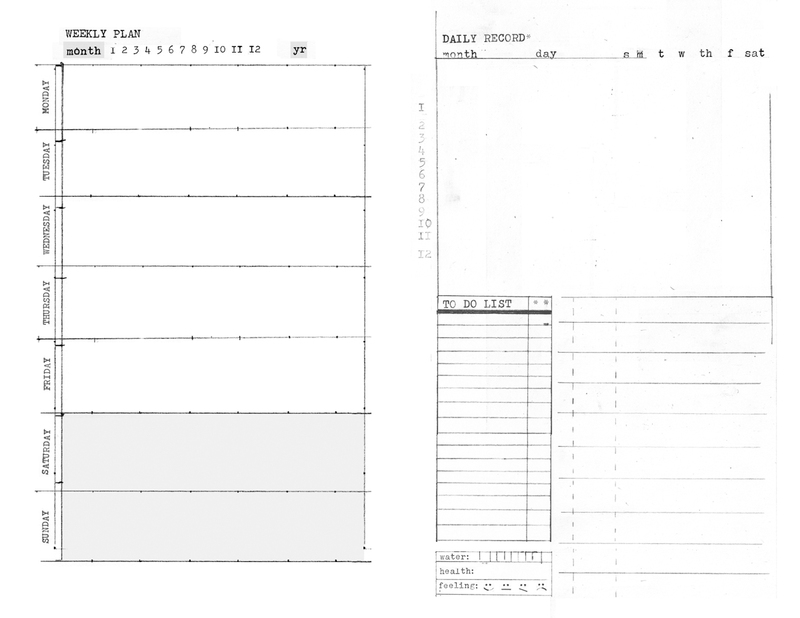 Now that I’m using my smaller planner I’ve had a lot of questions about printing the 5.5″ by 8.5″ planner templates. I always recommend using Adobe Reader – it’s a free application and I’ve ran into less troubleshooting issues with it than other options. If your settings don’t look exactly like the screenshots below it’s ok – you should still have all the same options. 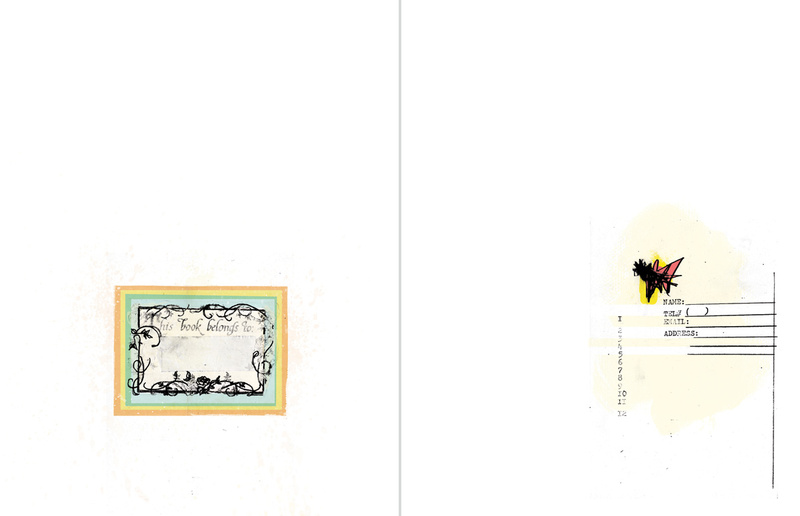 These were taken from Adobe Reader 11 on a Mac running OS X 10.9.5. After opening the file select Print underneath File in the application menu. This opens the print dialogue box. You’ll see that the default set-up is for 8.5″ by 11″ paper. To change this we need to add 5.5″ by 8.5″ as an option. In the bottom left corner select Page Setup. From here we want to change the Paper Size. When clicking on that item you’ll see a big list of common paper sizes. Scroll down to the bottom and select Manage Custom Sizes. 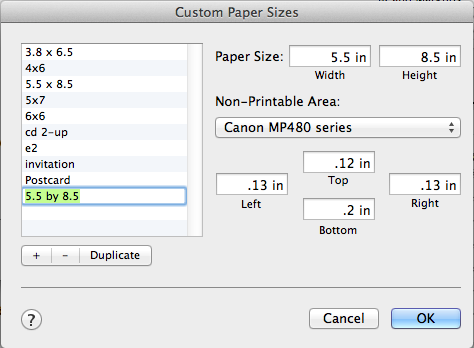 The left side will show a list of all your custom paper sizes you’ve added. Underneath select the + symbol to add a new one. 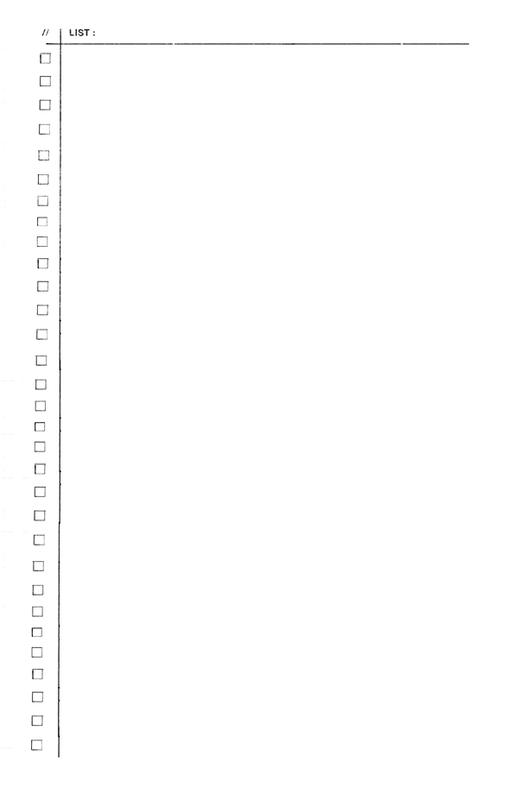 This creates an Untitled file at the bottom of the list. Click into Untitled and type 5.5 by 8.5. 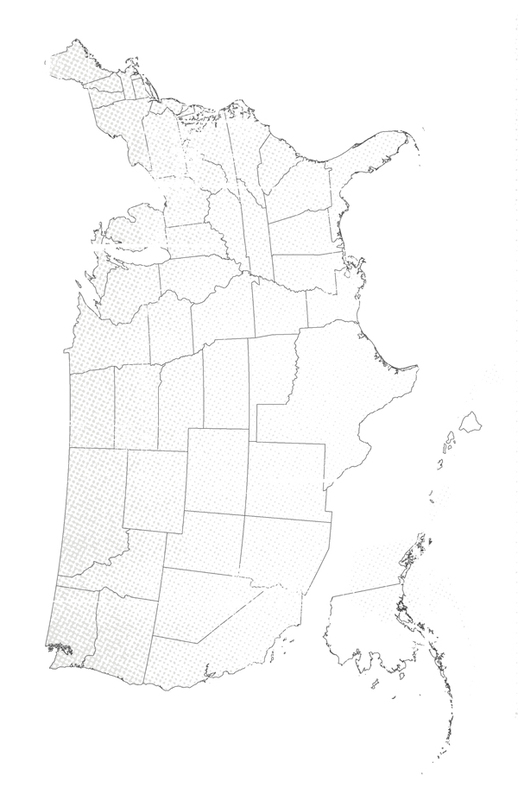 Then fill in the area to the right with the dimensions. When you select your printer from Non-Printable Area: it should fill in the top, left, right and bottom margins for you. 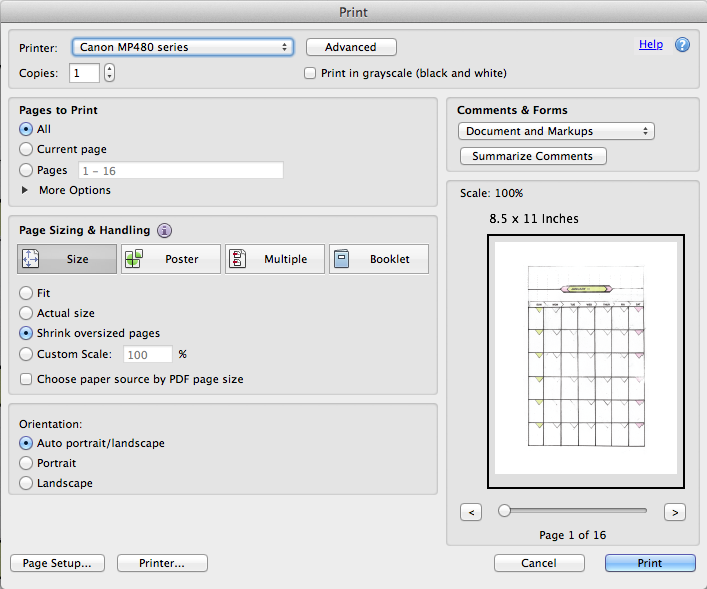 The adjustments in the Print Dialogue Box will depend on your printer and if you want to print the pages individually or all at once. 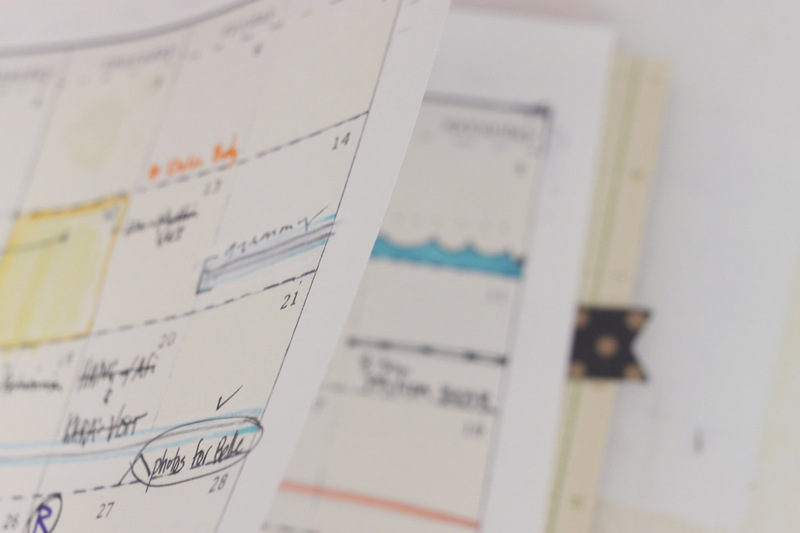 I print all my templates one at a time onto 5.5 by 8.5 paper as I need them – even the months. 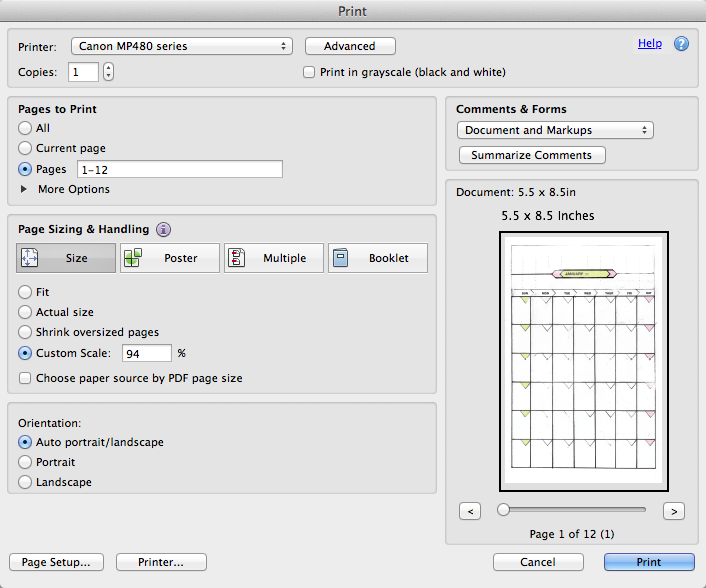 On the print screen select your Printer first and make sure the print preview is showing your template the right direction and fitting within your paper. 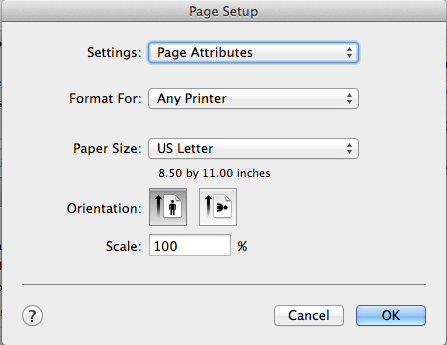 Under Pages to Print > Pages type in 1-12. 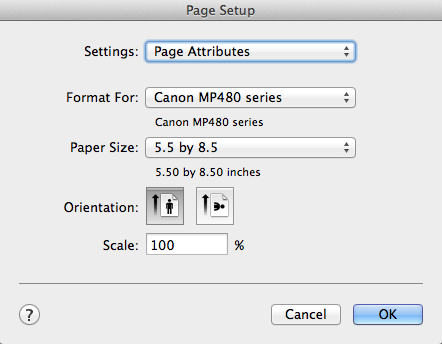 The Page Sizing & Handling area will depend on your printer. I scale mine down to 94% so that none of the page is cut off. Yours might be more or less, you really just have to do a test page and adjust it accordingly. Try the Fit option first, hopefully that will work for you. Before we hit Print think about the first month you’re printing. 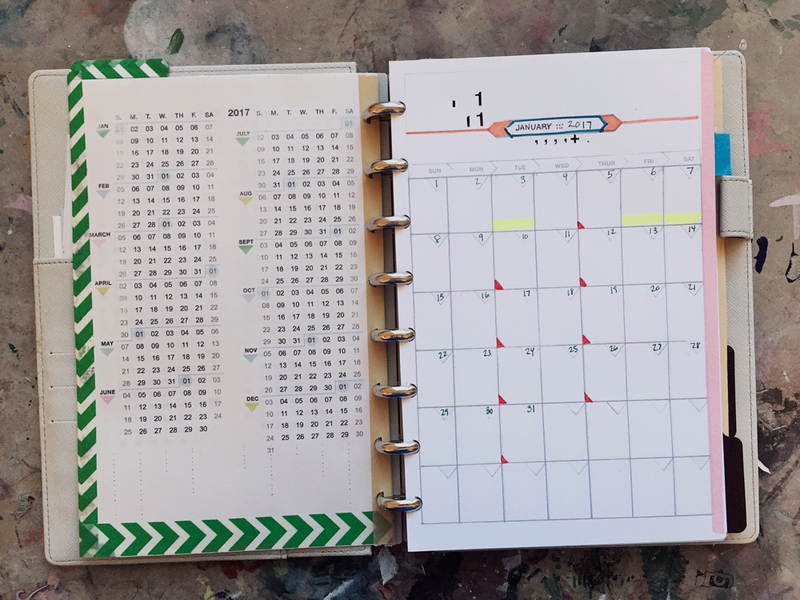 If you start with January do you want it to be on the right side of your planner or on the left so that February is directly across from it in a two month spread? 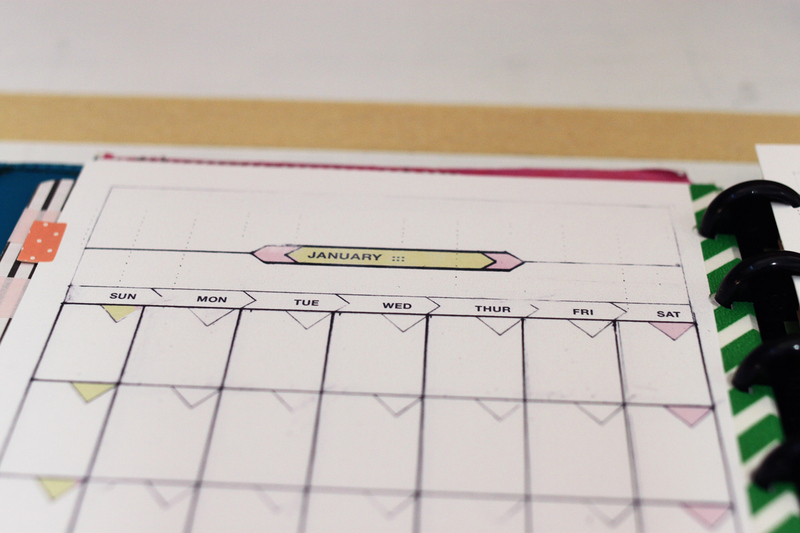 Depending on your preference January should be printed on a sheet by itself or with February on the back. 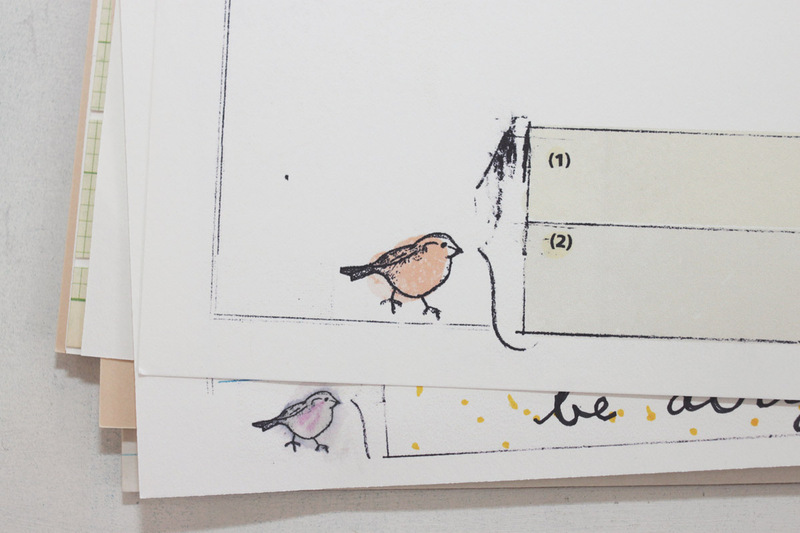 For this example we’ll have February printed on the back of January so that all months are double sided. Place ONE sheet of paper in printer. Take printed month out of the printer, flip it over and put it back in to print the next month on the other side. Repeat adding and flipping paper until finished. It’s important to have only one sheet of paper in the printer at a time or else it will keep printing all the pages on a single side. This way it prints once and then the printer alerts you that you’re out of paper while you flip it over and put it back inside. 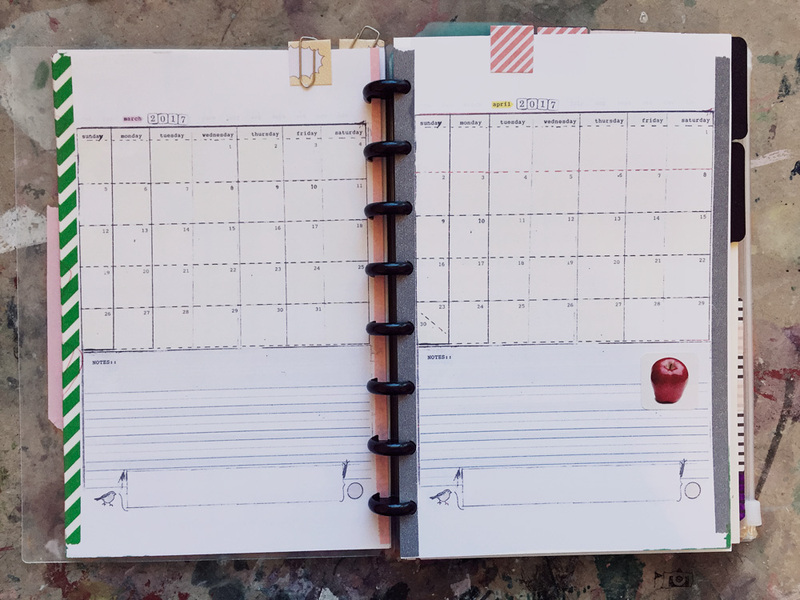 You could always print the months out one at a time – instead of all 12 – but that adds a bunch of extra clicking around. 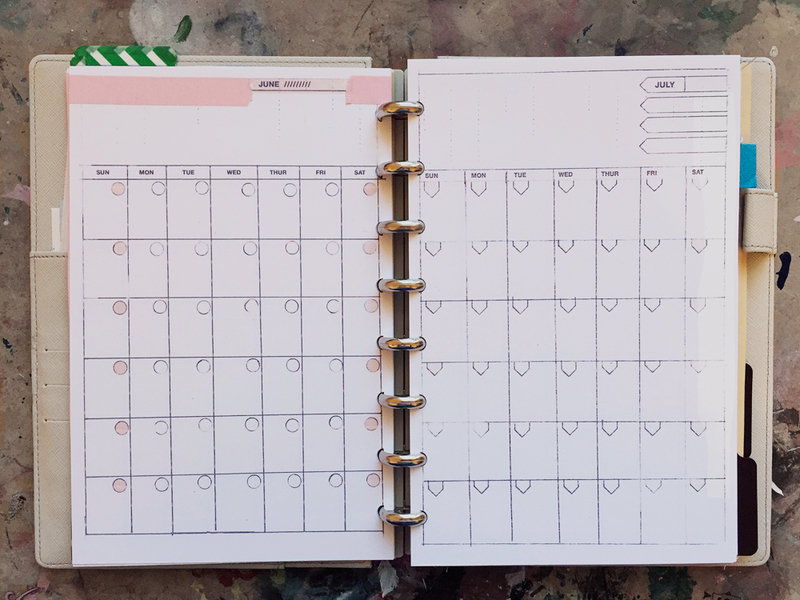 If you’re doing a huge daily dated set for a year I can see how you’d definitely want to print all at once using the even/odd settings. Laura from I Heart Planners has a great explanation (Steps 3. and 4.) of printing all your pages at once or even printing them 2-up on 8.5″ by 11″ so that when you cut them they’ll be double sided in the right order. Awesome! 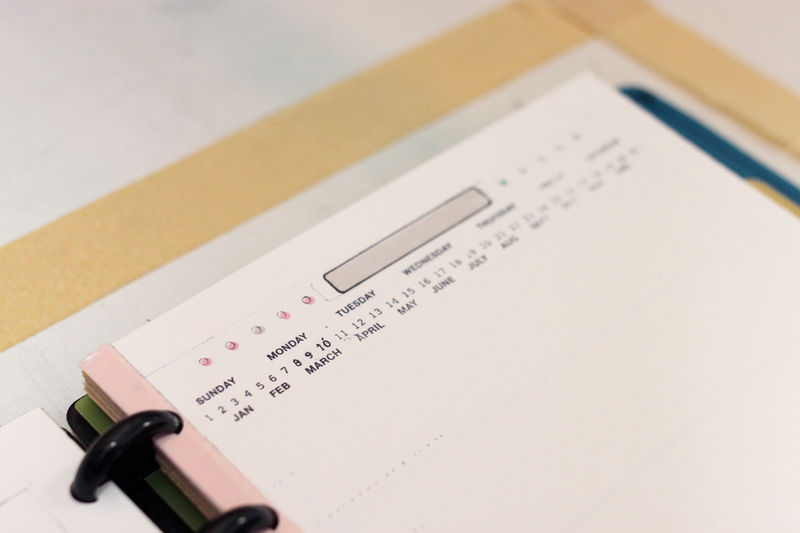 New planner templates for sale: 5.5 by 8.5! Half Letter! Half size! The size is awesome whatever you call it because you just cut a piece of letter-sized paper in half and voila! * Upon purchasing you will receive a download link at the email associated with your Paypal account. You should receive the download link within minutes of purchasing, if you don’t please check your spam folder. Cut your letter-sized paper in half first and set up your printer to print 5.5″ x 8.5″ – make sure and select fit image to paper in your print settings so nothing gets cut off. These were printed at around 94%. 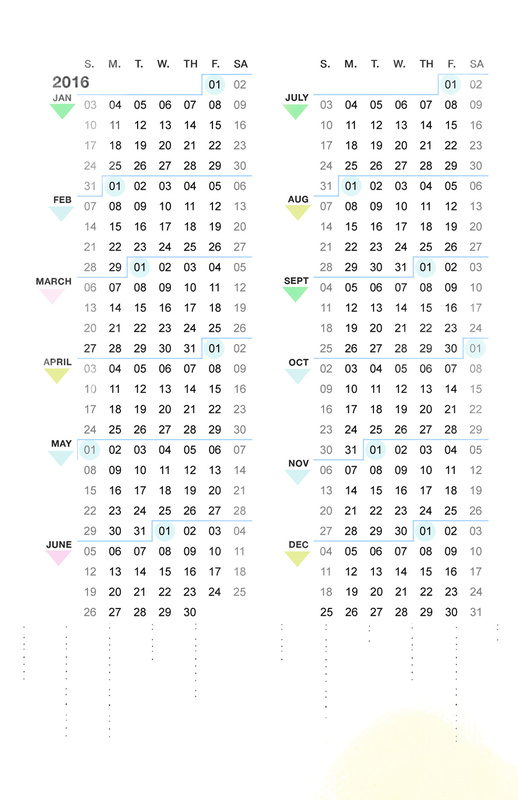 Print the months on a heavier card-stock. 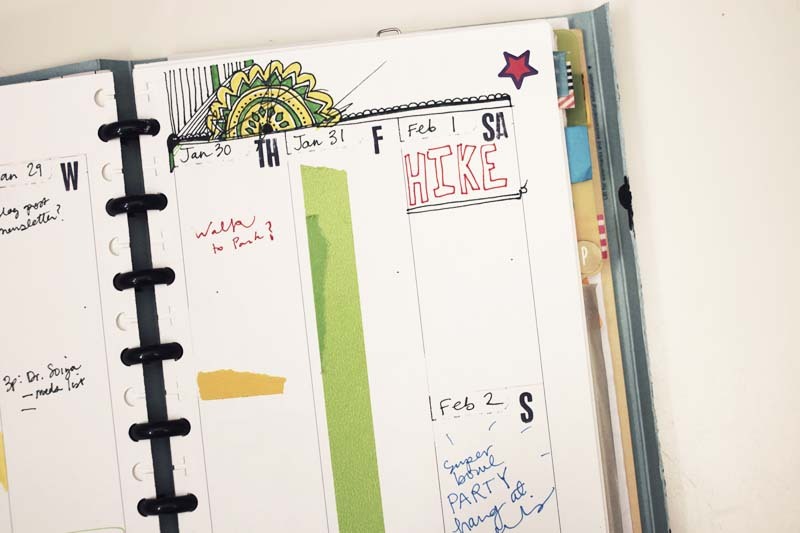 Thinner paper wears out faster when taking it in and out of the notebook. 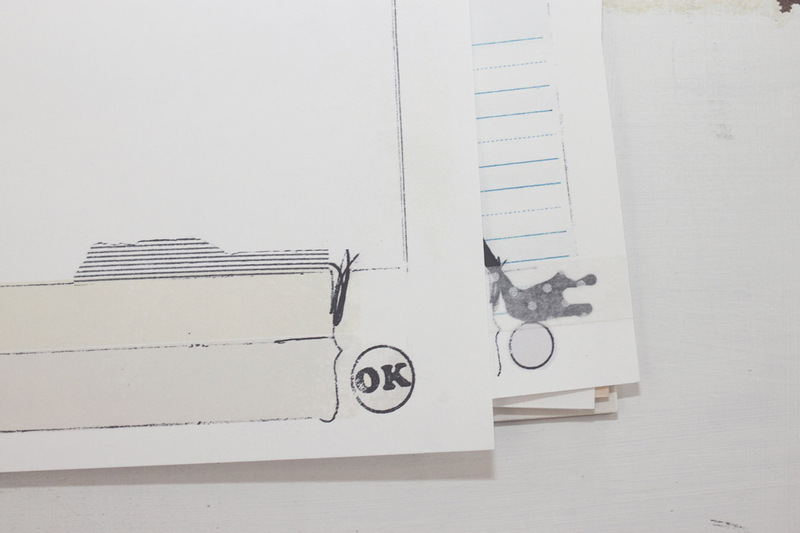 Also, you can put a strip of tape along the edge before punching the holes in the paper. Looks cool AND reinforces the edges. 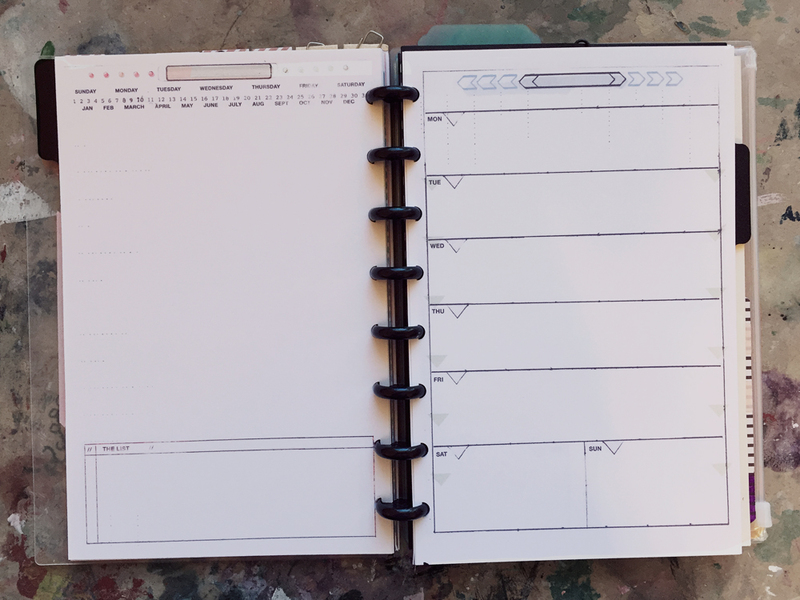 Spent the afternoon going through old files and decided to repurpose some 4 x 6 notecard pages into new 5.5 x 8.5 templates for my junior discbound planner. 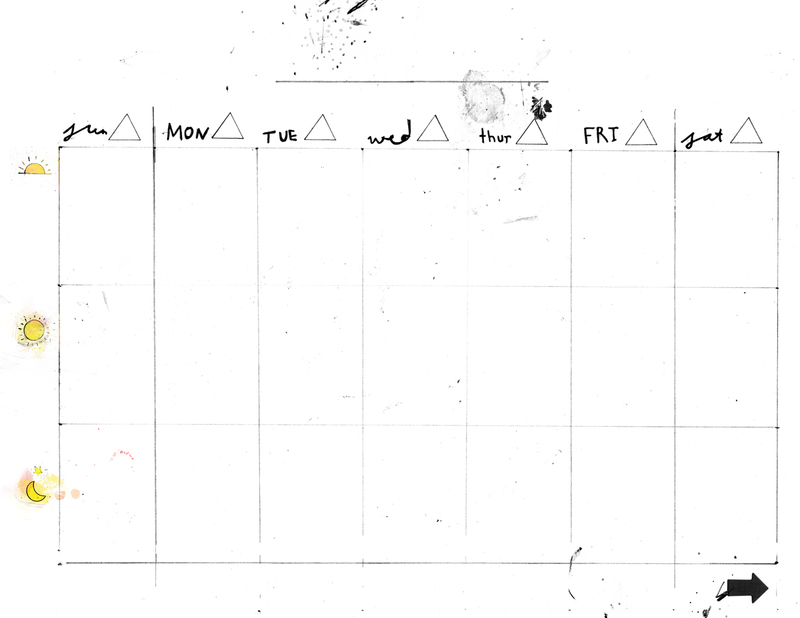 Simple week, day and month views. 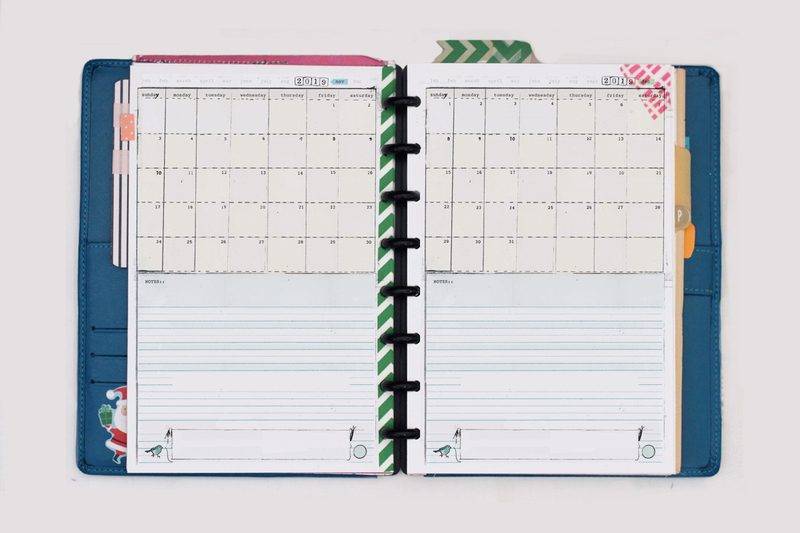 The month is sideways which I enjoy with the discbound because the discs don’t get in the way while writing. 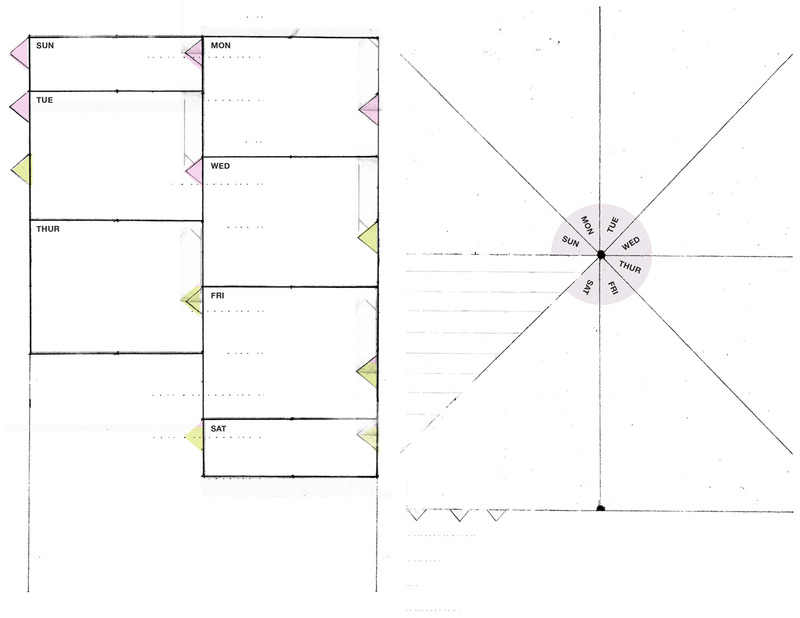 Also, looking through all my old posts it looks like I’ve never even shared the 4×6 templates on my blog – how is that possible? I guess that’ll be next! 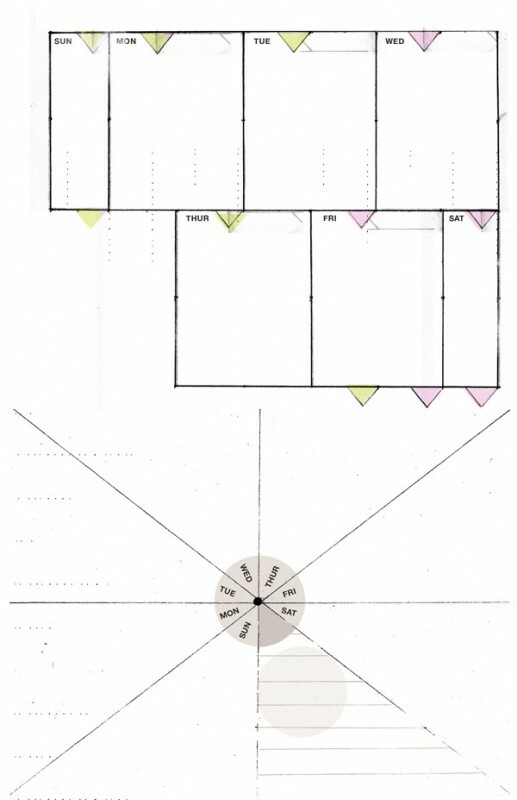 I’m revisiting smaller templates as I’m becoming obsessed with Project Life stuff, thinking of all the ways to incorporate the two. Fun! Discbound to 2015 and beyond! 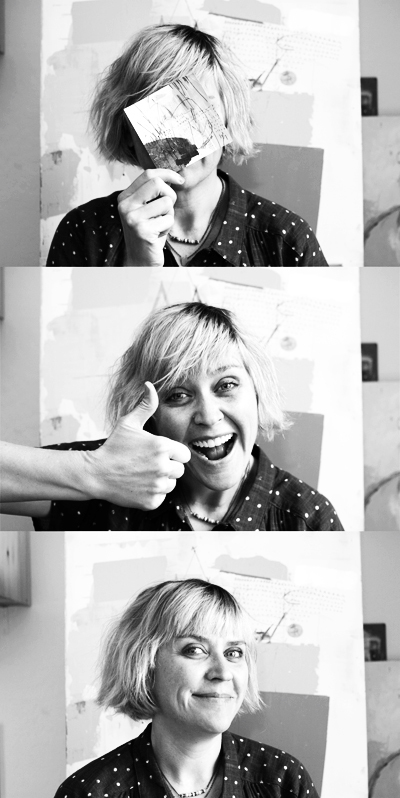 And then I took a long nap and woke up feeling relaxed so I redesigned my website, of course. 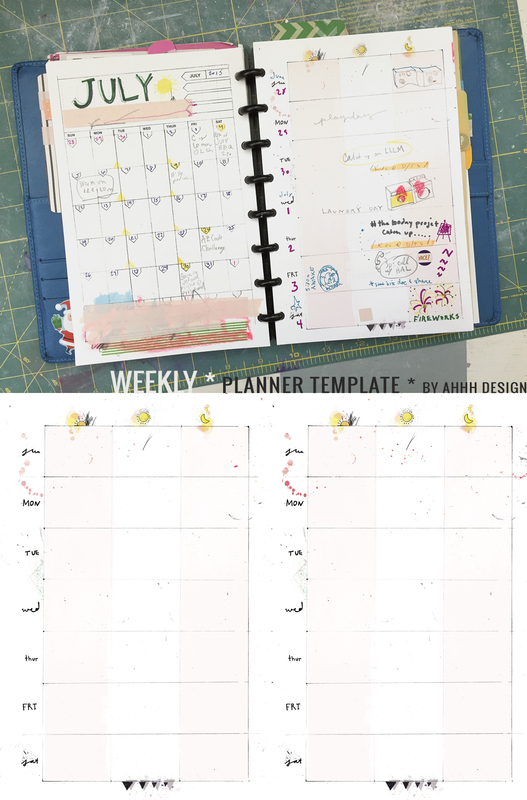 I also decided I’d like to make a new set of 5.5″ by 8.5″ planner templates to sell before the end of the year – which is exciting. 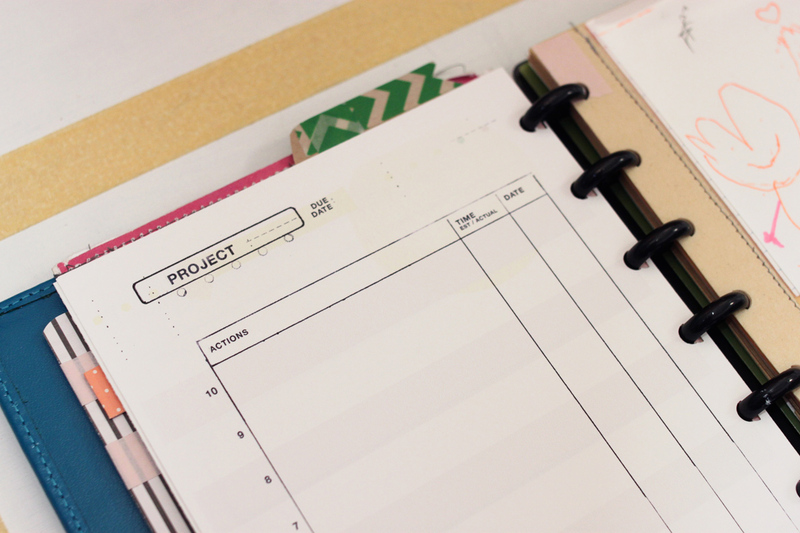 So far I have the monthly template done and want to include to-do, project, goal and daily templates. 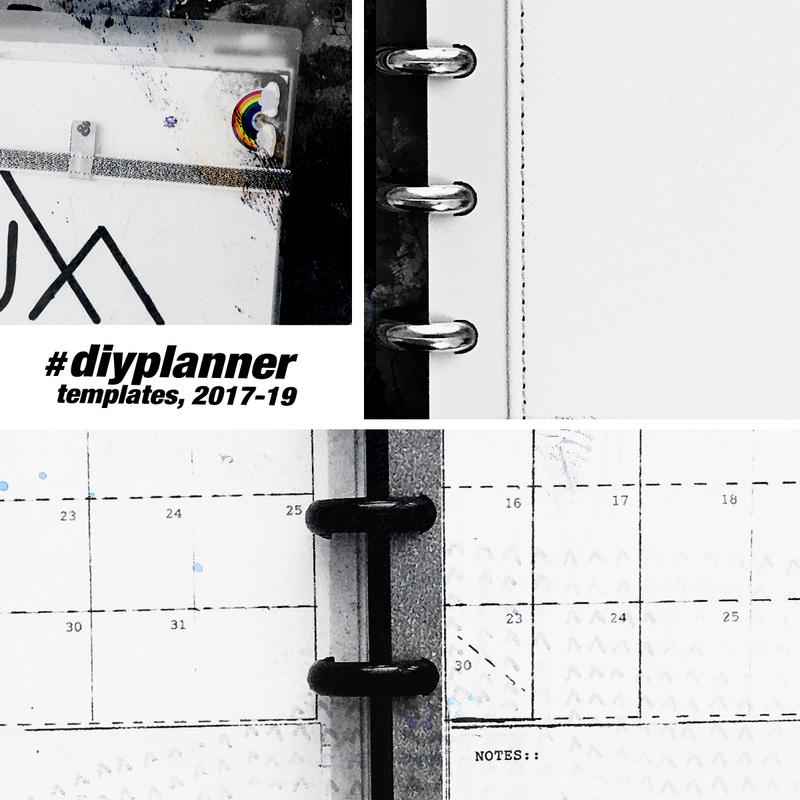 I might do a new 8.5″ by 11″ template too, or freshen up the one I currently have up for sell [DIY Printable Planner Templates]. I made a new cover for my planner out of a sheet of scrapbooking paper. I cut it the same size/shape as the plastic tab I was using for the cover and added some decorative tape and a paperclip to stick them together, super simple. I love how customizable the discbound is. 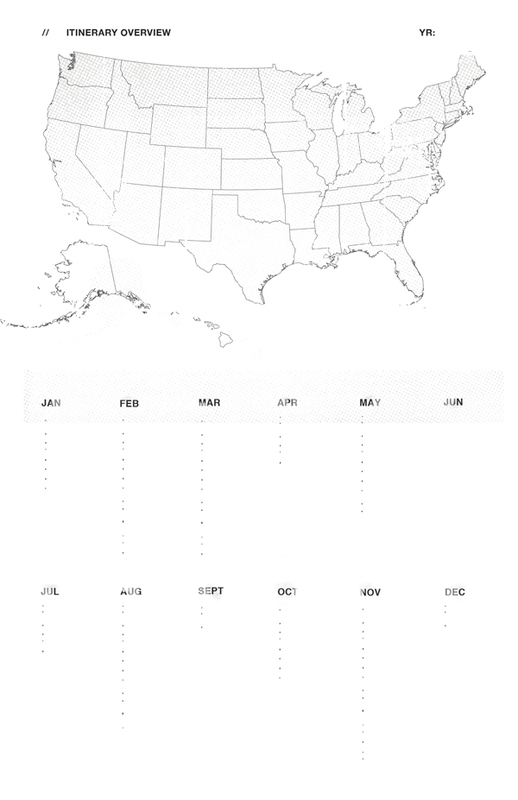 Below are the monthly templates that will be available to buy in the next few weeks. There will be one for each month but I’m leaving the days blank so they can be used anytime. AND I have a free download for you too! 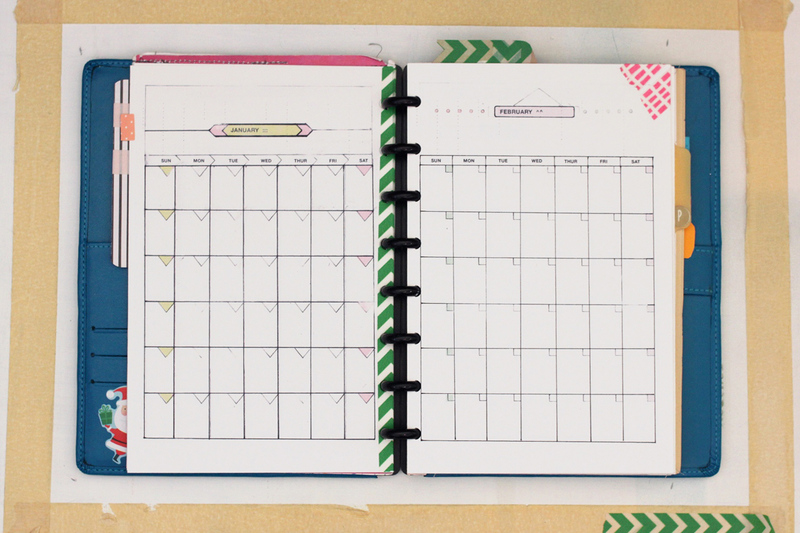 It’s two weekly tracker templates, both in 5.5″ by 8.5″ to fit your small discbound planners. I also made an even smaller version – print it out on 5.5″ by 8.5″ and then cut it in half so it’s half the size of your full page (see below). 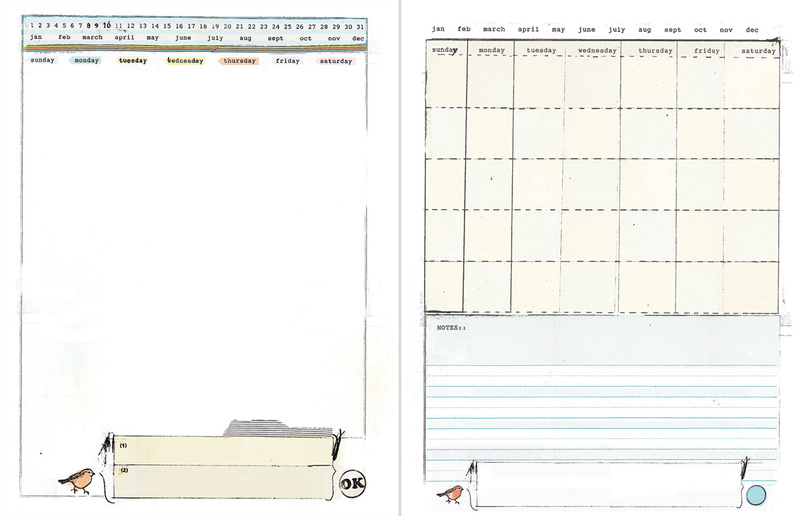 My Printable Planner Template through 2015 are available too, get ‘em while they’re hot! !